Sony has announced the highest-capacity Memory Stick PRO Duo to date. The card is called Sony Memory Stick PRO Duo 32GB and it lets handycam owners record full HD movies (1920 x 1080 Full HD) for 225 minutes using this memory stick card. Owners of the latest models of Cyber-shot digital cameras can record up to 29 minutes of video in Fine mode (MP4 1280 x 720). 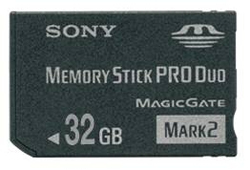 The Sony Memory Stick PRO Duo 32GB memory card will be on the marked in September 2009 and cost about $200. The Memory Stick PRO Duo line now goes all the way up to 32GB thanks to the launch of a new high-capacity model. The Memory Stick PRO Duo 32GB will have a particular appeal to the owners of HD Handycam who need long-duration, stable HD recording capability. To put this in context, Handycam owners shooting in FH mode (1920 x 1080 Full HD) can now record 225 minutes (3 hours 45 minutes) of HD video using a single card. It is perfect for events such as weddings, birthday parties, and athletic events. You do not have to worry about running out of memory! HD Handycams are not the only things that will benefit from the size and stable recording characteristics of the 32GB card. For example, HD video clips capture the moments by using the latest models of Cyber-Shot. And with the latest models of Cyber-shot, each video clip now can be recorded up to 29 minutes (using Fine mode: MP4 1280 x 720). You can enjoy shooting Video clips with Cyber-shot more than ever. And newly announced Cyber-shot™ TX1 and WX1 are allowing a continuous burst of full-resolution images and creating sweeping panoramas by combining a burst of images. These outstanding features demand an uncompromising approach to the memory. With its ability to store 7 hours 38 minutes of HD video (1280 x 720, 30 fps,mono) or 6,500 pictures at 12 megapixel resolution pictures, the Memory Stick PRO Duo 32GB is great news for Cyber-shot owners as well as anyone with an HD Handycam. Sanyo in Japan has announced a new HD camcorder called Sanyo Xacti DMX-CG11. 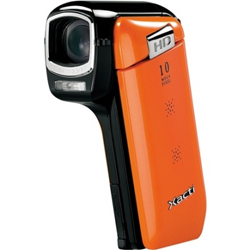 The camcorder will have 5x optical zoom and able to record in 1280×720 pixels resolution. It is not known if the Sanyo Xacti DMX-CG11 will be sold outside Japan, but it will sell for ¥30,000 ($318) when it hits Japan in September 2009. 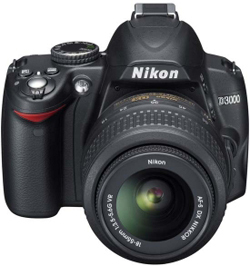 Photography Blog has reviewed the Nikon D3000 digital camera. This entry level DSLR sports 10 megapixels and a 11-point autofocus system. Photography Blog ends up giving the Nikon D3000 a Highly Recommended (4.5 out of 5 stars) rating as it is a very good camera. The only downsides are the lack of video recording and Live View that you can get in DSLR cameras from competing brands, but hopefully Nikon will add that in the next model. Read the full review of the Nikon D3000 DSLR camera here. Lets Go Mobile has reviewed the Apple iPhone 3Gs mobile phone. This Apple phone features a 3.2 megapixel camera so it will be interesting to hear what the reviewer thinks about its photo capture capabilities. Lets Go Mobile gives the Apple iPhone 3Gs a 80% score as it is a very good phone, but according to the reviewer offer little innovation. When it comes to its ability to capture pictures the 3Gs seem very nice. It uses the whole screen as viewfinder (except for a small part for shutter button) and you can select where on the screen you want the focus point. A little downside is that there is only a shutter button on the screen and not a physical one. Another interesting point is that the phone automatically auto focus without using the shutter button so taking a picture is very fast. That might be a bit hard to get used to when you usually use the shutter button to focus. 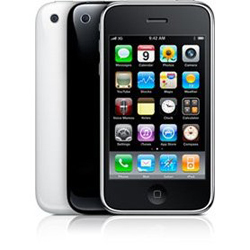 Read the full review of the Apple iPhone 3Gs phone here.